Angela has had a 30 year career in the community sector across metropolitan, rural and regional Victoria. She has extensive practice experience in a range of portfolio areas including child protection, the juvenile and adult justice system, disability services and community support. 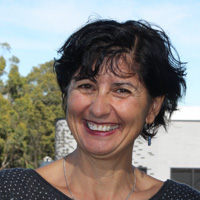 Much of her work has involved working with rural and regional communities; a focus which has fuelled her interest in building research knowledge and evidence that is responsive to the unique elements of rural and regional human services practice. Angela joined Federation University Australia in 2000 as a lecturer in social welfare and as a researcher working with communities on a variety of education, welfare, capacity building and justice issues. Angela has undertaken graduate work in both criminology and education and completed a PhD on evidence based policy and practice for regional service delivery. Since completion of her doctoral studies she has worked with a range of government and non-government agencies in implementing evidence based policy and practice initiatives. Angela's current research is focused on community legal services, with a view to the development of evidence based strategies and resources that are best able to enhance equitable outcomes for individuals and groups in the community. 2006 -Evaluation of Strengthening Generations Communities that Care Project. 2005 -Evaluation of Ballarat Health Services Adult Day Programs. Teaching first, second and third year students in the Bachelor of Arts (Rural Social Welfare) program in the areas of: Social Policy; Orientation to Welfare; Professional Practice and Research; Working in Human Services Organisations; Fieldwork; Group work. Teaching Nursing Students in the Bachelor of Nursing program. Teaching Masters Students in the Masters of Social Enquiry. Supervision of Capstone Students in the Bachelor of Arts (Rural Social Welfare) program. Fieldwork liaison of second and third year students in Bachelor of Arts (Rural Social Welfare) program. Principal and Associate Supervision of PhD students. All programs in the areas of: Family Violence; Out of Home Care; Residential Services; Family Mediation; Youth Homelessness Services; Mentoring; and Human Resources. Negotiation with the Department of Human Services on funding and program issues. Budget management. Supervision of senior agency staff. Agency representation at senior management forums - local, regional and state wide. Provision of staff training in: Case Noting; Implementation of Looking After Children. Policy and Procedure analysis, review and development. Implementation of quality enhancement framework for practice in Out of Home Care, Family Violence and SAAP services. Development of Regional Training Package on the Looking After Children Evidence Based Guided Practice Case Management Model. Development of Statewide Training Package (in conjunction with the Department of Human Services) to support the Statewide implementation of the Child, Youth and Families Act (2005). Provision of staff training across Grampians Region in: The Looking After Children Case Management Model. Provision of staff training across Lisa Lodge and Child and Family Services in: Case Noting; Team Building; Implementation of Evidence-Based Practice. Establishment of Evidence-Based Practice initiative across Lisa Lodge and Child and Family Services. Establishment and initial implementation of quality enhancement framework for practice in Out of Home Care across Lisa Lodge and Child and Family Services. Fieldwork supervision of second and third year students from the Bachelor of Arts (Rural Social Welfare) program at the University of Ballarat. Provision of carer training and support. Development of staff orientation program and resources. Development of staff supervision resources. Murphy, A. (2018). Using spatial technology for learning and connection: The Spatial Connect project. Interaction, 46(2), 20-23. Murphy A, Dahlhaus P and Thompson H (2016) Historic Urban Landscapes and Visualising Ballarat: citizen participation for sustainable urban planning and design. Locate 16: Distruptive Technology for a Smarter Society. 12-14 April 2016, Melbourne. Murphy A, Thompson H and Dahlhaus P (2016) Making intangibles tangible: visualisation informing, engaging and empowering community for embedding cultural heritage within the public domain. EVAA 2016: Electronic Visualisation and the Arts Australasia 5-6 March, 2016, Canberra. Dahlhaus PG, Murphy A, MacLeod A, Thompson H and McKenna K (2015) Changing practices: the impact of making groundwater data visible through an interoperative web portal in Victoria, Australia. AQUA2015, 42nd IAH Congress, September 13-18, 2015, Rome, Italy. Murphy A (2010) Victims won't even report the crime let alone use support services: the complexities of building pathways to victim support services for marginalised people. Presentation at the Meeting the Needs of Victims of Crime Conference, Sydney, May, 2011. Murphy A (2009) Spaces, connection and creativity: the road to a stronger community in rural Victoria. Presentation to the International Conference on Creative Communities, Griffith University, April 2009. Murphy A, Murphy A, Greenslade D (2008) Planning opportunities and delivering services for young parents (PODS): an individual and community wellbeing program. Presentation at the Population Health Conference, Brisbane, July, 2008. Murphy A (2008) Administrative management or enhanced practice: the role of evidence-based practice on the road to quality. Presentation at the AWAC conference, Sydney, August 2008. Murphy A (2007) From academic trekking to practice reality. Keynote paper presented at the University of Ballarat Annual Research Conference, Ballarat, November. Murphy A (2005) When urban policy meets rural practice: barriers and enablers to the implementation of evidence-based practice. Presentation to the National Institute for Clinical Studies, Melbourne: August 2005. Murphy A (2005) Communities that care: evidence based practice and strengthening generations working toward prevention science in a large regional community. Presentation to the National Communities that Care Conference, Centre for Adolescent Health, University of Melbourne: June 2005. Murphy A (2004) When urban policy meets regional practice. Paper presented at the University of Ballarat Annual Research Conference, Ballarat, 3 November. Murphy A and McDonald J (2004) Clinical health practice in a remote setting: the impact of local community relationships. Paper presented at the Australian Sociological Association Annual Research Conference, Beechworth, 8-11 December. McDonald J and Murphy A (2004) Still on the outer edges? : Progress towards and prospects for the development of a rural and remote evidence base for clinical practice. Paper presented at the 8th National Rural Health Conference, Alice Springs 2005. Murphy A (2003) What is evidence-based practice anyway? A rural survey. Paper presented at the 7th National Rural Health Conference, Hobart. Murphy A (2003) Drowning, not waving: rural social workers face the rising tide of evidence-based practice. Paper presented at the University of Ballarat Annual Research Conference, Ballarat. Murphy A and Dow B (2002) Academic tesearch with industry partners. Paper presented at the University of Ballarat Annual Research Conference, Ballarat. Brown L, Murphy A and Mann S (2001) Building on success in rural and remote communities: insights from the Grampians Region of Victoria. Paper presented at the 6th National Rural Health Conference, Darwin. Brown, L., Murphy, A., & Green, R. (2000). Creating partnerships: an Australian experience in rural health. Proceedings of the Rural Communities and Identities in the Global Millennium International Conference, Malaspina University College. Murphy, A. (2011). The service delivery implications of the Children, Youth and Families Act (2005) for community service organisations across Victoria Monograph Series. Melbourne, Australia: Centre for Excellence in Child and Family Welfare. Murphy, A. (2009). An investigation of the emerging service delivery and governance implications of the Children, Youth and Families Act (2005) for community service organisations in regional Victoria, Monograph Series. Melbourne, Australia: Centre for Excellence in Child and Family Welfare. Patrick Bonney (PhD Candidate, Federation University Australia) - Linking community and waterway management through citizen science.